I don’t have any doggie news or photos to share (which is why no blog post last week), so I thought I’d offer up some photos from the farm side of things for a change of pace. Alayne took these shots of me working on firewood on Friday. 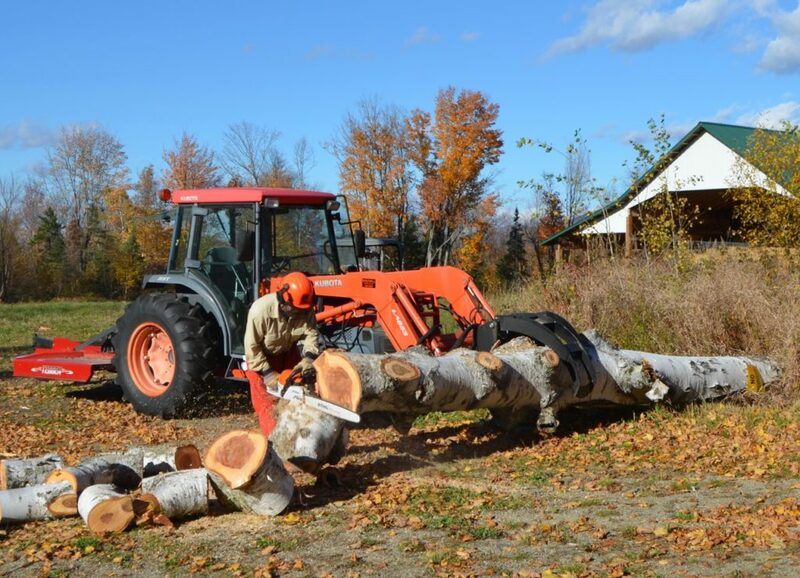 That thing on the front of the tractor is a grapple, which is a simple but awesome piece of equipment that saves my back and makes working on trees much safer. I can use it to lift an entire tree up off the ground, hold the tree at a comfortable height for chainsawing, then saw it?into rounds without ever having to muscle the tree around on the ground. 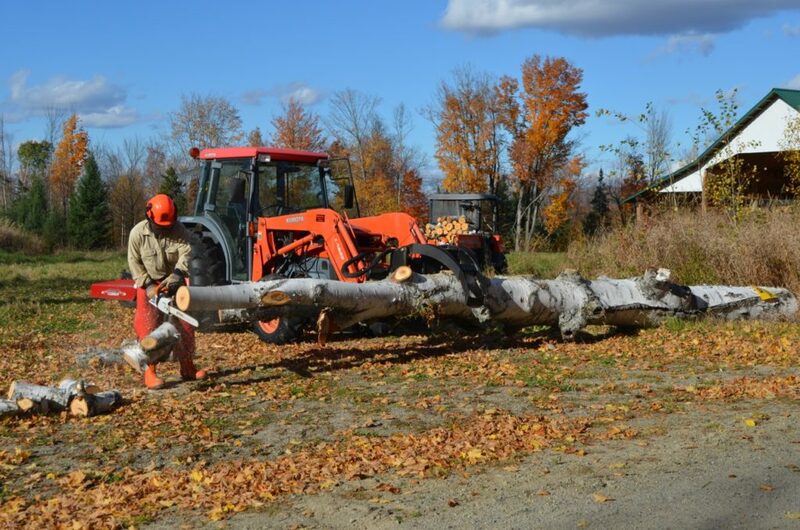 Now, that big old birch you see there?is much bigger than normal firewood size trees, and the tractor can’t lift this one entirely off the ground, but it can still raise it up to make sawing much easier. The town of Lancaster sent their road agent?out to look at it, and he agreed it should come down to avoid it crashing across’the road during a storm. 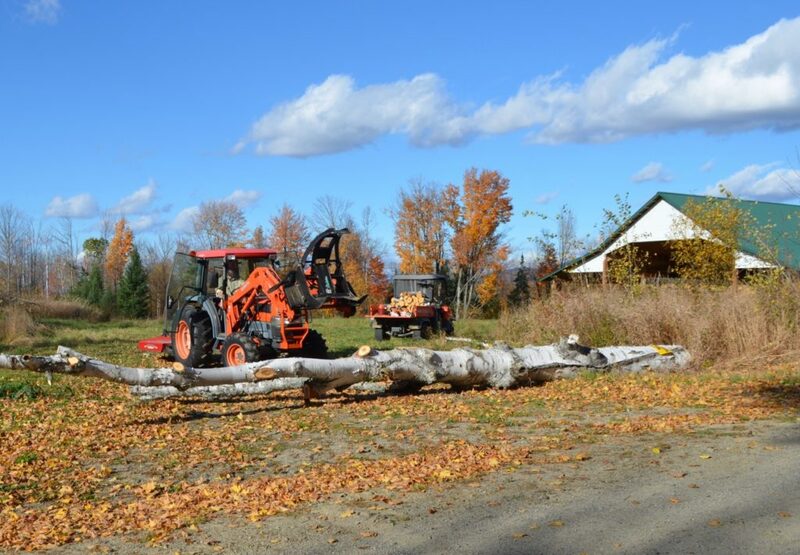 So a week ago the town road crew arrived and, using a large backhoe to push on the birch as they cut it — to ensure it fell onto our property and away from the road and power line — in a couple of minutes the tree was on the ground. It turned out to be a good call, because the tree was completely hollow at the base, with only about 6?inches of wood surrounding more than a foot of hollow interior. It wouldn’t have taken much to send this thing over in a windstorm. I had told the town folks that if they knocked it down, I’d clean it up, de-limb it, and use the tree for firewood. So on Friday I set to work. 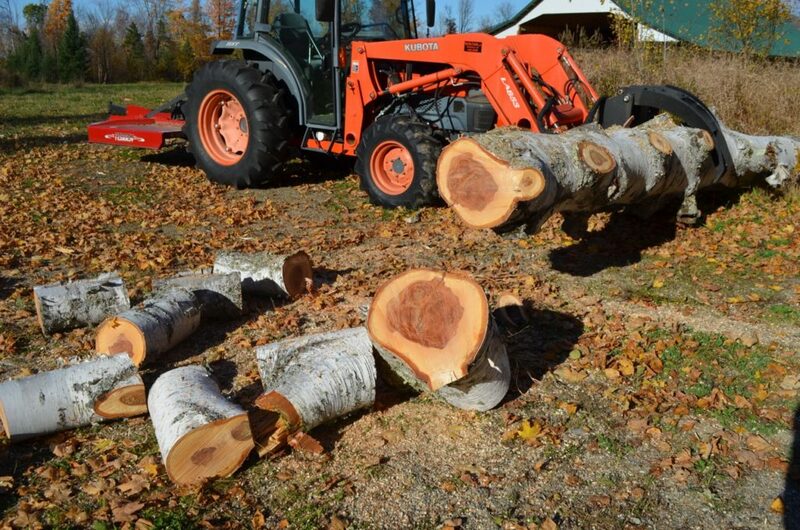 The logs from the smaller branches I’ve cut up are already in the back of the utility vehicle behind the tractor. The two raised beds you see there with the hoops have a fall crop of lettuce (Bronze Arrow) in the back one and chard (Fordham, in the foreground). The carrot beds are outside the frame of the photo. We haven’t done fall greens outdoors before, so this was an experiment to see how far into fall we could keep greens growing in this climate. Even though I got them planted later than I should have, they have still done amazingly well. Having a warmer than usual autumn has certainly helped. The white fabric?you see bunched up there is the row covers we put over the hoops if we’re going to have freezing temperatures at night. The biggest test will come on Wednesday night, when we are forecast to be 21?. 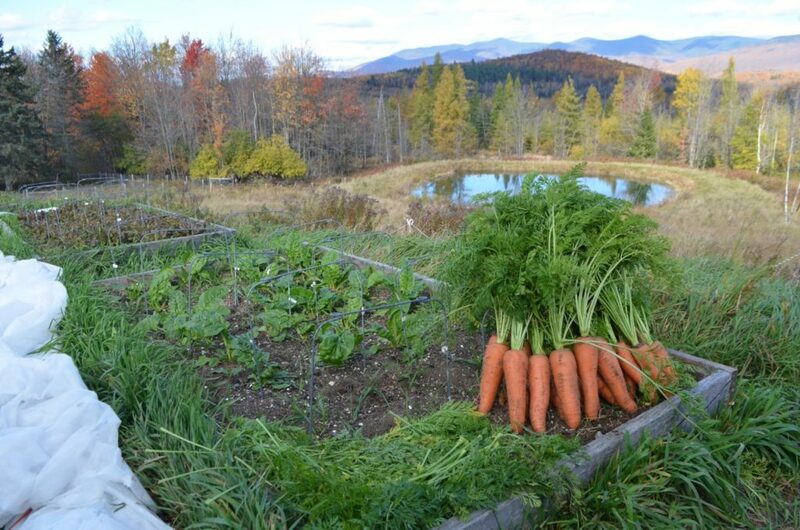 As you can see from the carrots, Alayne’s got a bumper crop again — big and beautiful, crisp and sweet. Though so far we haven’t grown a carrot so large that we’ll need the grapple to handle it! We woke up yesterday morning to a surprise snowfall — about an inch that lasted until mid-day. By the time I took that photo, the snowline had already crept back up the mountainside quite a bit. Today there’s still snow up there. Wow!!! I’m very impressed with your logging & farming adventures. Good job!!! Brrrr, cold compared to TX right now. Thanks for sharing these! I’m not much of a heavy-equipment geek, but even I can admire the grapple. As a constantly-failing gardener (thank you, suburban deer herd, hope you enjoyed it), I very much admire the carrots. And the snow on the mountains is beautiful. Stay warm! I am so happy that every dog is o.k. When there wasn’t a post last week I kept thinking that you might have had more bad news to tell us. So glad that wasn’t the case. Those carrots are huge! 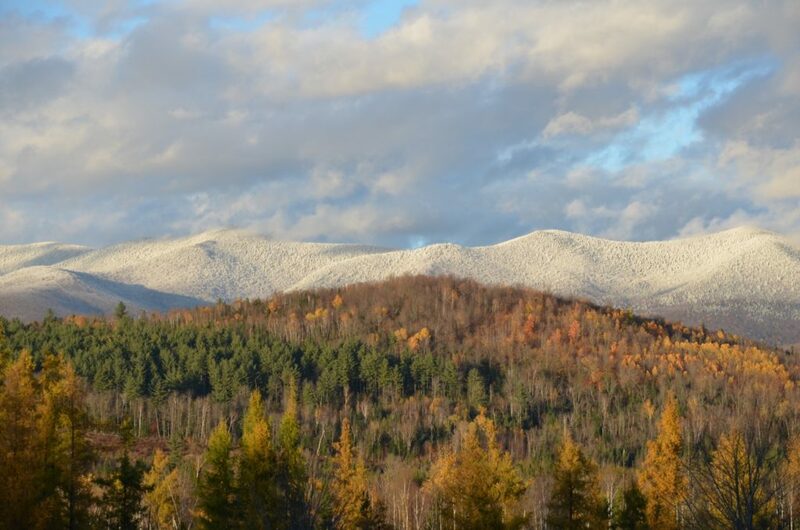 Love to see the snow covered mountains… just prefer to stay in FL where it’s hot, LOL. Thanks for sharing! You posted some beautiful photos! Bet you were ready for a hot tub soak after cutting the tree down. We hope you are all doing well at the farm and enjoying the Fall weather. Beautiful scenery shots and wonderful No News is Good News from the furry side of the farm!! Although I look forward to furry blog posts, I’m always interested in how self-sustaining you and Alayne have become there in NH. Wood cutting is one of the most satisfying activities I get to do. Couldn’t do without my Stihl and my Kubota. I’ll have to look into the grapple attachment. We use our bucket a lot to move large chunks of trees, but that grapple looks like it would make moving downed trees even easier. Noticed you left the brush hog on the back. Works pretty good to balance when you’re loading stuff in the front. It’s kind of scary to realize you back tires are coming up off the ground if you have too big a load in the bucket. Yikes.